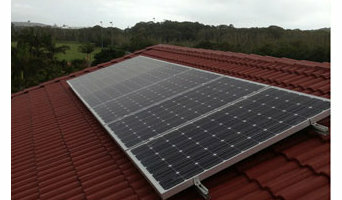 Ecoteam provides accredited solar system design and installation. We install on and off-grid solar panel systems in the Northern Rivers area of NSW (including residential and remote areas). Our team includes qualified electricians who can ensure that the system integrates with your home or business. Energy Medic is a local (Alstonville) electrical contracting company with primary focus in Solar Photo Voltaic (PV), Stand Alone Power Systems (SPS), Hybrid (Grid Connect with battery storage) As a local business the point of difference is one-on-one service from beginning to end. Luke will do the site inspection, energy audit and system design to suit your needs, quotation, installation and commissioning. We build a relationship with our customers and provide excellent after sales service. We also carry out residential power and lighting jobs specialising in landscape lighting. FRONIUS SERVICE PARTNER Trained by Fronius Australia to carry out on-site repairs. (Top of the range inverters made in Austria) SELECTRONIC ACCREDITED INTEGRATOR Trained by Selectronic to ensure proper installation and full warranty of Australia’s top of the range SP Pro battery inverter. (Made in Australia) WINAICO AUTHORISED RESELLER/INSTALLER Only selected installers have access to these solar modules - made in Taiwan - 15 year product warranty -TOP PV Brand Seal Australia 2018 from EuPD research. SOLAR ANALYITICS MONITORING Authorised installer and reseller of Solar Analytics whole site active monitoring. The two main solar power systems are on-grid and off-grid. On-grid systems – also referred to as grid-tied and utility interactive – are connected to your mains power supply. If your Bexhill, New South Wales home produces more energy than it uses, your meter goes down and you generate credits with your energy provider (check your state government for details on any rebates available). On-grid solar panel systems have lower equipment and installation costs, and will save you money through net metering. There are three main types of solar panels that can can generate electricity for your Bexhill, New South Wales home: monocrystalline, polycrystalline and hybrid. The basic monocrystalline celled panels are fairly efficient and have outstanding performance in cooler conditions, but are marginally more expensive than polycrystalline, which works better in hotter conditions. Hybrid panels use crystalline cells with a thin layer of film, which attracts more energy. This makes hybrid models the most efficient solar panel installation, but also the most expensive. To talk about which solar panels are best for your home and how much energy they produce, contact a Bexhill, New South Wales solar panel company or installer on Houzz. Find a solar power contractor on Houzz. Search the Professionals section for Bexhill, New South Wales solar power contractors or browse Bexhill, New South Wales Photos of completed installations and then contact the professional responsible. Here are some related professionals and vendors to complement the work of solar power contractors: Lighting, Pools & Spas, Electricians.